The long-awaited eighth series (season, as it is referred to in the U.S.) of the popular medical comedy premieres Thursday, Jan. 24 at 8 p.m. on some PBS stations. In Los Angeles, it airs on KCET, a non-commercial educational independent television station. American Public Television distributes the series in the U.S., and PBS stations may carry it. 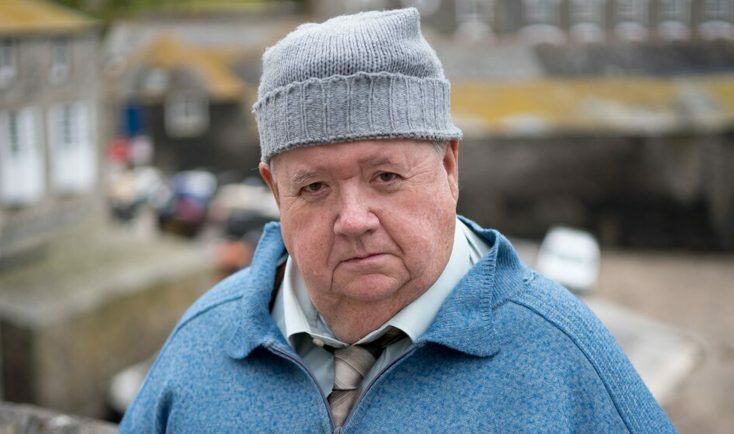 McNeice, 68, serves as the trusty friend to the show’s star, Martin Clunes, who plays Dr. Martin Ellingham, a general practitioner (GP) whose combative attitude and tactlessness regularly creates mayhem in the sleepy seaside community of Portwenn. The series, which premiered in Britain in 2004, airs roughly every two years thanks to a comfortable schedule that allows the show’s writers and producers (including Clunes’ real-life wife Philippa Braithwaite) a generous amount of time to create and film the series on location in Port Isaac in Cornwall (which stands in for the fictional seaside village of Portwenn, home to colorful villagers). 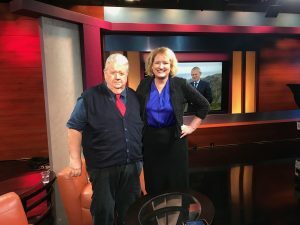 McNeice (whose resemblance to the late revered statesman Winston Churchill has presented with him opportunities to depict him on screen on several occasions, including a gig on another popular British import “Doctor Who”) is in town to tape a pledge special on KCET, having just arrived a day earlier. On this winter day, he’s soaking up the Southern California sun, which is somewhat familiar to the Brit, who lived here for a decade before returning home to England. Q: Have you been to KCET or Los Angeles previously? McNeice: About three years ago, we did the same thing at KCET. We had a great time last time and so it was a delight to be asked back a second time. Q: You’ve been playing Bert Large, on and off, for 15 years now. McNeice: (He laughs.) Oh my goodness me. It’s my pension. Please don’t let it stop. I need it, really. If it’s to the end of my days, it’s great. Q: Having played this character so many years, do you feel Bert is a part of you and are you a part of Bert? McNeice: Absolutely. I tell my own children that Joe Absolom, who plays my son Al on the show, “This is the son I always wanted.” The whole gig is a family affair. We’re going back down to Port Isaac in April to start the new series, Series 9, of “Doc Martin.” It will be like a family coming back together to see each other again. The crew is much of the same people, the actors, and it’s a great thing. I think everybody on this job kind of pinches themselves because it’s a job from heaven, really. Q: The scenery alone at Port Isaac, where you film the show, is simply gorgeous. You’ve probably contributed a lot to their tourism industry. McNeice: Oh yeah. Because on a regular day when we’re filming there, 200-300 people are in the village who’ve come to see how (the show) is made. It’s like doing live theater. We could be filming a scene in the village and there are 200-300 people looking on. Q: What is the secret of the series’ popularity for so many years? McNeice: Part of the reason why it’s lasted so long is that the scripts are very tight and very good, and because they’ve been worked on. If ITV (the British company that produces the series) had had its way, the series would have been every year, and I think we would have been over by now. But, because we actually make it every other year, it gives Martin (Clunes) a chance to go off and make his documentaries about dogs, horses and other animals, and other shows as well. It gives the writers and producers a chance to come up with good storylines to work on. That’s a big reason why we’ve done so well, I think. Q: At the start of Series 8, Bert is very invested in his whisky business but it’s not going well. McNeice: Isn’t that a surprise! And, actually, things go from bad to worse (for him). I’m not going to talk too much about what happens in the series because I like people to have that surprise as they go along. Certainly, when you look at Bert, things are going to go on a downward spiral. Q: It looks like there’s never a cloud in the sky at Portwenn. McNeice: That cracks me up. It’s such a lie. If you look at the ground, it’s almost always all wet. What they do magically with silver boards and lighting, they make it all glitter and look sunny. It’s all a trick. Last season was alright. But we’ve had some terrible summers where you wake up in the middle of June or July and you think it’s November. It’s not all sunshine, I have to say. I’d like to move it to Los Angeles, where it’s sunny every day. Q: How long will you be on location? McNeice: We start in March and go through July. Two weeks per episode and we have eight episodes. We made the mistake the first season we were there—we went into August. The problem is the schools open, and the place is twice as busy when the schools open. So, ever since then, we time it so we’re there when schools are on their summer break. So, it’s a four-month gig. Q: What have you been doing since the last season wrapped? McNeice: I took a year off because, unfortunately, I’m getting a bit older now. I have arthritis in both knees so I took this time off to have two knee replacements. One in December, a year ago, and the other last July. I just wanted to spend some time getting myself back into gear. So, after the surgeries I had to do some rehabilitation, and I’m getting better now. I’m walking without a cane, which I had for a while, so I’m on the mend. Q: I’m sure your fans will love to hear that. McNeice: I have to tell you something funny. There are all these Americans that come over to do these tours of these locations where we film shows, like “Downton Abbey,” “Midsomer Murders,” “Poldark” and “Doc Martin.” There was this group of 35-40 Americans who were there for a week. At their last dinner in Windsor, they invited me down to do a talk. The organizer turned to the group—most of whom are in the 60s and 70s—and asked them, “How many of you remember Ian McNeice from ‘Ace Ventura: When Nature Calls?” Nobody put their hand up. He then said, “How many of you remember him as Winston Churchill from “Doctor Who?’” Nobody put their hand up. I asked the organizer for the mic, and said, “Hands up, any of you who’ve had a knee replacement?” All of their hands went up. “How many of you have had hip replacements?” Hands go up again. I said, these are the questions we should be asking. Q: Speaking of “Doctor Who,” you have an action figure of your character. McNeice: I do! One Christmas, I gave each of my three children—two boys and a girl–a present. I had them close their eyes and put a box in each of their hands and then said they could exchange with each other. Then I told them to open their eyes, and they said, “Daddy, you’re an action figure!” It’s true. There I am as Winston Churchill in a “Doctor Who” box. As far as I’m concerned, with that I’ve completely made it. Now, I’m just waiting for a Bert Large action figure. They’ve got everything else. If you go into the little shops in Port Isaac, they’ve got Bert Large biscuits, Bert Large chocolates, key rings, mugs, everything. Q: And your daughter has painted some of the locations around Port Isaac, right? McNeice: Yes, she’s done these loving little drawings. She’ll be absolutely thrilled that she got a mention. She’s done some really good ones. I asked her, “Why not put Bert in there and it can be like ‘Where’s Waldo?’” You can pick me out in all sorts of locations. Q: Does your family come with you when you go on location? Q: I know you’ve had special guests in previous seasons like Sigourney Weaver. Are there any special guest stars popping in for Season 9? McNeice: You know why she was on the show? Selina Cadell who played Mrs. Tishell attended drama school with Sigourney. They were best friends and have been friends ever since. Sigourney watched the show because Selina was in it. Sigourney was on a chat show in Britain, the Jonathan Ross Show” with Martin, and she said she’d love to be on the show. He thought it was a joke at the time but later realized she had this link to Mrs. Tishell. Not only that, but she came back a second time. I’m hoping we get Brad Pitt for the next series. That’s what I want. As far as guest stars, there is some talk that this could be the final series. Nothing’s been set yet but there are rumors that it’ll be the final series. I’m sure there will be something up their sleeve about what they’ll do for the final series. Q: What are your hopes for 2019? Q: You and Martin Clunes have become these beloved TV icons. How would you describe him, having worked with him so many years? McNeice: He’s nothing like the character he plays. He’s the funniest, warmest, kindest individual and I have so much admiration for what he does with this show. Just how he can get those extraordinary medical terminations out the way he does—they just run off his tongue so easily. The way he forms his procedures when he has to inject people or tie them up with a tourniquet, it’s just impressive what he does. I’m a huge admirer of his; I think he’s a very clever man. Q: It was a pleasure speaking with you. Best of luck with Season 9. McNeice: Thank you. Before I go, I would like to thank my fans on Facebook, the Bert Large Lovers Group. There are more than 1,700 members now in this group that was started by this lady called Gloria. I just want to thank them for their support.